The City of Palm Coast Public Works Utility personnel work daily to maintain these lines to ensure that your wastewater flows, either by gravity or pump, to the treatment facility to be cleaned and disinfected to a quality acceptable to be released into the environment. The Utility also uses a portable closed circuit television camera (CCTV) to identify problems that would otherwise be left to guesswork. The Camera is lowered into the manhole and inserted into the main pipeline. Utility technicians can observe the condition of the line as the camera is propelled through the system. Any problems in the line are recorded and these are then added to the repair list to be completed by the construction crews. Other maintenance programs include smoke testing of gravity sewer, repairs to failed gravity lines utilizing cured in place (CIP) fiberglass liners. Wastewater is a byproduct of human activities, whether it's residential activities such as bathing, washing dishes or flushing toilets, commercial activities as in food service (Restaurants, Clubs, Grocery Stores, etc. ), car washes, auto service centers and medical services ( Hospitals, Urgent Care, Doctor & Dentist Offices, etc.) or the industrial activities of manufacturing, storing and handling various products. The Wastewater produced or generated from these various processes as a combined flow when it reaches the treatment facility contains approximately 1.7 % solids, which means 98.3 % of the wastewater is water and yes, there is a lot of wasted water in wastewater. Wastewater leaves your home from sink and shower drains, washing machines, dishwashers, and commodes and enters the City's sanitary sewer system. A vast network of pipes lie unseen under the ground as well as a Low Pressure Pretreatment Effluent Pumping System (PEP) and main pumping stations that function continually day and night to carry your wastewater to the Utility's Wastewater Treatment and Water Reclamation Facility. The City of Palm Coast Public Works Utility personnel work daily to clean and maintain these lines to ensure that your wastewater flows, either by gravity or pump, to the treatment facility to be cleaned and disinfected to a quality acceptable to be released into the environment. Daily Maintenance of lines includes cleaning and repair work. Lines are cleaned to rid them of grease build-up, grit and gravel, root intrusion, and other debris. The Utility uses a variety of equipment to perform this cleaning which includes vacuuming, jetting with water pressure, root cutters, etc. Repair work consists of excavating lines and repairing holes, offset joints, and other problems in the main lines which have developed over years of settling, weather, and harsh usage. The Utility operates a closed circuit television camera (CCTV) to identify problems that would otherwise be left to guesswork. The Camera is lowered into the manhole and inserted into the main line. Utility technicians can observe the condition of the line as the camera is propelled through the system. Any problems in the line are recorded and these are then added to the repair list to be completed by the construction crews. Other maintenance programs include smoke testing of gravity sewer, repairs to failed gravity lines utilizing cured in place (CIP) fiberglass liners. Influent entering the Wastewater Treatment Facility contains materials such as rocks, grease, sand, and other undesirable materials that must be removed before the treatment process. The objective of preliminary treatment is to remove this material by two vertical mechanical bar screens constructed of stainless steel designed to remove debris three millimeters or larger. This material is collected and disposed of at a local landfill. The influent master pump station contains six submersible pumps designed to pump 3200 gpm (gallons per minute) and lift the influent flow up to the headwork's structure. At this point the influent is screened to remove sand and grit that was not previously removed at the initial screening and then evenly discharged to the three aeration basins. Three one million gallon 125' long by 54' wide and 15' deep treatment tanks referred to as aeration basins are where the biological process takes place. A cultivated bacteria group comes in contact with organics and nutrients contained in wastewater. The bacteria will utilize the oxygen introduced with the mechanical aerators and store nutrients within their cell structure. Six Clarifiers of 65' in diameter and vary from 12' to 15' receive flow from the aeration basins and are used to separate the solids and produce effluent. As the solids settle to the bottom of the clarifiers it is returned to the aeration basins and the effluent continues to the filtration process. Four disc filters are used to capture and return solids in the water. In order for effluent to be used as Reuse, it has to have a solids concentration of less than 5mg/L or less than five pounds of solids per one million pounds of water. The City of Palm Coast Utilities Pretreatment Standards Section 7 and City Ordinance 07-10 (link) prohibit any discharge into the sanitary sewer system that would have an adverse impact on the collection system, treatment facilities, and ultimately the environment. The Pretreatment of Wastewater is basically the removal of ant desirable product(s) from the wastewater stream prior to the wastewater being discharged into the sanitary sewer system. An example of pretreatment is the function of grease interceptors and traps that are required at food service establishments in order to reduce the amount of Fat, Oil and Grease (FOG) from the waste stream before discharge into the sanitary sewer system. The easiest form of pretreatment is to not put it down the drain. Garbage goes in the garbage and contaminants such as unused or out dated medications have prescribed disposal methods and dedicated disposal sites.For helpful information on Household Waste Disposal visit www.epa.gov/wastes/. In 2007 the City started an evaluation and pretreatment inspection program in order to monitor City, State and Federal requirements for wastewater pretreatment and discharge. The evaluation of existing and newly proposed commercial and industrial facilities is to determine whether pretreatment is needed and if so, what type and degree of pretreatment is required. The pretreatment inspections are performed annually in order to monitor compliance status and process changes. It's a TOILET, Not a Trashcan! Toilets are only meant for one activity, and you know what we're talking about! Whatever ends up in your toilet can potentially impact the water environment, so it's really important to keep household wastes such as window cleaners, unused or expired pharmaceutical products, paint thinners, fats, and fruit labels out of toilets and drains and dispose of them properly. For more information and a Household Waste Chart, visit www.wef.org/WorkArea/linkit.aspx?LinkIdentifier=id&ItemID=685. Every day the average adult uses nine personal care products that contain 126 unique compounds that could end up in our water. In addition to traces of products like shampoo, toothpaste, sunscreen, and cosmetics, minute amounts of prescription and over the counter drugs also make their way into water. They should be limited or prevented from entering our environment. In addition to following product recommendations for use and disposal and decreasing use when possible, you can help keep our water clean by simply not flushing unused medication down the toilet! Controlling what goes down the drain is the easiest and most effective way to protect the environment. For more information on how to dispose of prescription and over the counter drugs visit the White House Office of National Drug Control Policy consumer guidance for the Proper Disposal of Prescription Drugs at www.fda.gov/NewsEvents/PublicHealthFocus/ucm226353.htm. Over 50% of blockages of main lines in the gravity sewer system are caused by commercial or residential household grease. To respond, clear, and clean up these blockages is costly to the citizens of Palm Coast. The City Utility maintains an Industrial Waste Pretreatment Ordinance created by City Council as a tool to help educate, monitor, and police the food industry in Palm Coast. Grease blockages can cause backups into homes, business, and overflowing manholes. Please pour cooking oils into a can such as an empty vegetable or coffee can, and toss it in the trash. Many residents and businesses are using "flushable "wipes as a convenient product. These products are found in varieties such as baby wipes, cleaning and dusting wipes, and all-purpose wipes. Many of these are advertised as "flushable". These wipes do not disintegrate in water. They become lodged on roots and intrusions in the sewer line, and wrap themselves around pumps and motors in sewage pumping stations. These wipes cause backups into homes and overflowing manholes as well as increased maintenance and emergency calls at pumping stations. Please DO NOT FLUSH any type of disposable wipe. A clean-out is an opening into your private sewer line that may be used to clear your service line in the event it becomes clogged. These clean-outs should be located up near your house or in your front yard near the property line. On newer homes there will be a clean-out located in both locations. If caps are broken or missing, rainwater and debris pour into the sewer system through these openings in your private line. This water flows to the Wastewater Pumping stations and is then conveyed to the Treatment Facility. This is a huge source of inflow/infiltration (I&I) into the City's sewer system, and results in increased pumping and treatment costs. If you have a broken or missing clean out call the Utility Customer Service at (386) 986-2360 and the Utility will repair or replace the clean out at no expense. If you do not know where your clean-out is located it is very important that you find and expose your clean- out to allow access to inspect your line in the case of a blockage and for the Utility to be able to access your service for cleaning. If you experience a sewer backup and the Utility can't access your service due to a buried or missing clean-out we will not be able to determine if the blockage is on the private side or City side of the service and you will be instructed to call a plumber at your expense. If you experience a sewer backup in your home always call the Utility Customer Service at (386) 986-2360 prior to calling a plumber. What is a PEP System? Pep stands for Pretreatment Effluent Pumping System and accounts for half of the wastewater collection system with the other half gravity sewer. The PEP system has several distinct characteristics such as smaller pipes made from PVC that does not have to be laid as deeply in the ground as the conventional gravity sewer system and manholes are not required. A simpler way to describe it is a septic tank system but instead of an onsite drain field the gray water is pumped into the wastewater collection system. 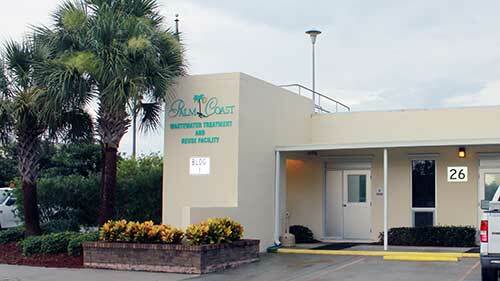 The system was designed and installed during the early development of Palm Coast when owned and operated by ITT Corporation. It was designed as an alternative to gravity sewer as a means of saving the capital expense cost. The system is installed during construction by City staff and is owned and operated by the City therefore there are certain criteria that must be met to assure the Utility staff can access your system for repair and maintenance. These criteria and more information on the PEP system can be found by going to the link labeled PEP System Information Guide. Sanitary sewage is a health hazard. If you experience a back-up, be very careful to avoid contact with sewer materials, which may carry infectious diseases like hepatitis and salmonella. If you do it yourself: Always wear protective gloves and boots. Rain gear is also advisable. Avoid contact with raw material, and be particularly careful of your face and eyes. Goggles are recommended when you are using a hose. Protect all cuts and scrapes. Immediately wash any wound that comes in contact with sewage. To clean up after a back-up: Hose down the area, then wash surfaces with hot soapy water. Disinfect surfaces with a 1:10 solution of household bleach and water. When you're finished: Wash hands thoroughly before preparing food or eating. Wash and disinfect any clothing and supplies immediately after use. The City of Palm Coast Wastewater Utility is on call 24 hours a day, seven days a week, including holidays. It is our goal to provide you with the highest level of service possible. If you are experiencing sewer problems, call Utility Customer Service at (386) 986-2360. We recommend you do this before calling a plumber, to avoid unnecessary plumbing bills. Utility crews will respond by checking the City's main line and service to determine whether the blockage is in the main line or in the customer's private service line. If the problem is found in the main, the utility will correct the problem. If found in the customer's private line, the customer will be informed of their responsibility for repairing or "clearing the line." The City of Palm Coast Utility is committed to providing exceptional community service. Feel free to call us with any questions or concerns at (386) 986-2360. We would appreciate your comments concerning the service you have received from any of our crews, employees, or services. The City of Palm Coast sewer system and treatment facility represents a multi-million dollar investment. Routine maintenance and cleaning is conducted daily by City staff in an effort to keep the lines cleared of obstruction and maintain a steady flow from your residence to the treatment plant. All of the maintenance programs are designed to help eliminate I&I (Inflow and Infiltration) and reduce the cost of treating this additional undesired water and debris to the wastewater streamflow. CCTV and cleaning of gravity sewer is the initial point of maintaining of the Wastewater Collection System. You must first know where the problems are before they can be corrected. The cleaning of the lines by the use of high pressure jetting and vacuumed truck cleans the debris and grease from the gravity sewer lines and makes it easier to run the CCTV equipment to identify defects such as cracks, offset pipe joints and leaking services. Each year Utility sets a goal to clean and CCTV and minimum of 10% of the gravity sewer system and consistently meets or exceeds this goal. In 2011 the Utility started a new smoke testing program to maintain the gravity sewer system and locate sources of I&I (Inflow and Infiltration). In this program smoke is forced into the gravity sewer system and escapes from the system via openings such as broken cleanout caps, cut sewer services from trenching equipment installing cable TV or telephone lines, or illegal connections to the system such as gutter downspouts, and pool drains. All defects are then recorded and repairs are made by Utility Staff. The goal of the Utility is to smoke test 20% of the gravity sewer each year and complete all recorded repairs. A spinoff maintenance program as a result of the CCTV and cleaning of gravity sewer to locate defects is installation of CIP (cured in place) fiberglass liners and pressure grouting leaks in manholes with urethane grout. The utility has trained personnel in confined space entry to perform this work. The fiberglass liners are placed inside of the gravity sewer pipe at the location of the defect and molded to form a "pipe inside of pipe" seal. The Wastewater Collection Department operates two Sewer VAC Trucks used in the day to day maintenance of the Wastewater Collection System. Besides cleaning gravity sewer lines the trucks are utilized weekly in the cleaning of grease and debris from pump stations. The high pressure jetting system is used to scour the walls then the debris is vacuumed into the truck and disposed of at a designated dump site. This program keeps grease and debris from being pumped to the treatment facility and helps eliminate damage to pumps and reduces after hours alarms. There are currently 154 pump stations in the Wastewater Collection System that are maintained by a highly diversified crew that are responsible for the inspection, maintenance, and repairs. The stations are inspected on a weekly basis for run times, electrical and pumping efficiency, and site inspections. Each year every station has an annual maintenance inspection that includes removing each pump and performing a comprehensive service including changing out fluids, wear rings, and impellors as needed. All components of the pump control panel and the SCADA (Supervisory Control and Data Acquisition) remote monitoring system are inspected as well. With over 14,000 Pep Tanks installed in the Wastewater Collection System it only represents half of the residential lots located in sections designated for Pep and therefore the Utility must have an affective preventative maintenance program in place. Utility Technicians inspect systems daily to assure that the system is working properly, make necessary adjustments, and replace components as needed.